Sharp this week debuted six new models in its lineup of projectors, ranging from a high-light-output, three-chip DLP model to a short-throw projector that can display images up to 100 inches from a distance of 4.3 feet. 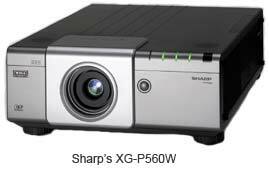 The XG-P560W is Sharp's first three-chip widescreen DLP projector. The installation projector offers a resolution of 1,280 x 800 (WXGA), a brightness of 5,200 ANSI lumens, and a contrast ratio of 1,800:1, with seven interchangeable lenses. With its standard lens (1.25x powered zoom), the XG-P560W sells for $14,995. Without a lens, it sells for $13,995. Sharp also introduced several mid-range DLP-based projectors, ranging from resolutions of XGA (1,024 x 768) to WXGA and brightness ratings up to 4,200 ANSI lumens. PG-D4010X (XGA resolution, 4,200 ANSI Lumens, $2,495). Finally, in the category of short-throw projectors, Sharp has introduced the PG-F267X, which can project a 100-inch (diagonal) image from 4.3 feet or a 60-inch image from 2.7 feet. The DLP model offers an XGA resolution, a brightness of 2,500 ANSI lumens, and a contrast ratio of 2,200:1. It's available now for $1,895.